Then all you need is 21 Day Fix. Achieving your fitness and weight-loss goals has never been faster—or simpler. You can lose the weight. In 21 days, you can be beach-ready for a vacation. Look drop-dead great at your upcoming reunion. Or be well on your way—REALLY well on your way—to reaching a major weight-loss goal. And all you have to do is decide. Then let 21 Day Fix do the rest. Because they're set up to fail. You get exhausted worrying about eating the "wrong" food. Sick and tired of spending hours in the gym. Blowing a week's worth of progress in one day. It doesn't have to be that way. 21 Day Fix helps you break the cycle. Here's why 21 Day Fix DOES work. It's not another diet. In fact, it's just the opposite. 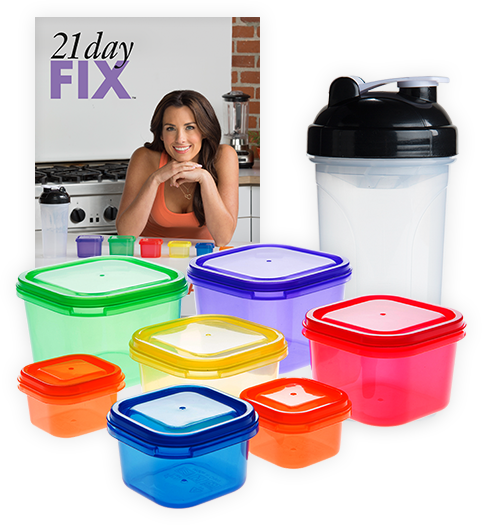 21 Day Fix makes eating and fitness so simple, anyone can get great results. With 21 Day Fix there's no counting, no guessing, and no wondering. Just easy-to-follow portion control and one 30-minute workout per day. That's all. If you're ready to get serious, 21 Day Fix can help you lose the weight. Stop wasting time on diets that don't work. There's a better way to lose weight. It's called 21 Day Fix. And it makes weight loss so simple, you can finally escape the diet trap and see results fast. Ready for a major calorie burn in only 30 minutes? We made these workouts short so you can get in, get out, and get on with your day. But that's no excuse for taking it easy. The workouts will challenge you at every level to help maximize fat loss. And there's always a modifier on screen to show you how to dial down the intensity without losing the benefits. Forget about ounces, cups, and calories. When it comes to losing weight, simplicity equals success. These seven color-coded containers and Shakeology® shaker cup deliver exactly the right portions every time, so you never eat too much or too little. Fill them up with as much food as you want—if it fits, you can eat it! You pick your goal. 21 Day Fix helps you reach it. "I can't believe I actually have abs. I've never been in shape like this. My body is completely changed. It’s super easy to do with a little bit of working out and eating right. 21 Day Fix is no joke." Results guaranteed or your money back. Still not sure if it'll work for you? Let us make it even simpler. We're going to let you try the entire program—the full 21 days—and if you don't get the results you want, simply send it back within 30 days for a full refund of the purchase price (less s&h). Think about that. You don't have to wonder if 21 Day Fix is going to work. You get to finish the program and then decide if you want to keep it. That's how convinced we are that you're going to love your results. In fact, we think it'll be the last weight-loss program you'll ever buy. So go ahead and try it for yourself. "I'm a bikini competitor—and a single working mom. I don't have time for complicated meal plans and hours of exercise, and neither do my clients. That's why I created 21 Day Fix. It's simple, fast, and will help you get results. All you have to do is follow my program, and you WILL lose weight. I promise—or your money back." Follow the simple program for 21 days, then send in your "before" and "after" pictures and we'll send you this FREE 21 Day Fix T-shirt.